If you’re looking for a blender that can break down whole fruits and vegetables into a smooth, drinkable smoothie, this is the personal blender that was designed to do exactly that. It can crush ice easily with its 900-watt motor and blend smoothies, shakes, or blended cocktails. The cups are BPA free and have Sip and Seal lids so you can blend and go. This includes one 24-ounce cup and one 18-ounce cup. You can buy more cups separately. The cups and lids are dishwasher safe. If you’re not sure what to make with your new blender, this includes a recipe booklet with 75 recipes to keep you busy. If you need a blender for single-serve morning smoothies, you don’t need a larger blender and huge jar – this little personal blender can do all that and more. Besides making the daily smoothie, you can use this to chop, mix, blend, whip, and grind small quantities of foods. The included cups and lids are top-rack dishwasher safe for easy cleaning. A recipe book is included that features 10-second recipes to inspire you to get the most use out of the blender and get you on your way in a flash. The blender is designed for easy use, with no buttons to press or settings to remember. Just put the cup on the base and press down to blend. This includes the power base, a cross blade, one party cup, one tall cup, one short cup, two solid lids, 1 flip-top lid, two comfort lip rings, and the recipe book. If you want a personal blender that can sit out on your counter and match the rest of your stainless steel appliances in your kitchen, then this combination blender and chopper from Cuisinart is for you. The blender comes with a main 32-ounce blending cup that has many features of a traditional blender—measuring lines, a top opening for adding extra liquid, and an easy-to-grip groove. But unlike a traditional blender, it also comes with four 16-ounce travel cups that can be used directly on the blender then taken on the go, and an 8-ounce blending cup perfect for dressings and marinades. What sets it apart from the other personal blenders on this list—in addition to the sleek black and silver or all white design—is the fact that it has multiple blending speeds. No, it’s not as fully featured as a Vitamix, but it’s a bit more versatile than other personal blender models. The set also comes with two blades for chopping and grinding, and all the cups and lids are made from shatter-resistant, dishwasher-safe, BPA-free plastic. And if you need a little inspiration when you first get your new blender, the included recipe book should give you a few ideas. The 700-watt blender makes blending a breeze. 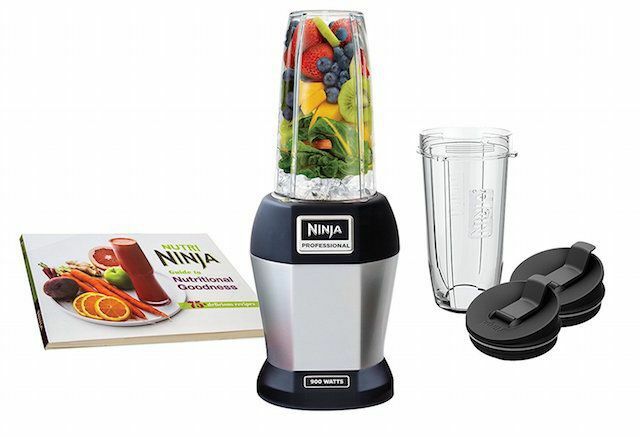 From salsas to nut butter and soup to crushed ice, nothing is beyond this blender’s reach and it comes with so much at an affordable price. The 15-piece set comes with both a cross blade and flat blade. The cross blade is better for chopping and grinding, while the flat blade works better for blending. You can also tackle coffee beans, spices and nuts with this model as well. The four included cups and five lids and two rings make this set incredibly versatile. To operate it, simply add ingredients to the cup, screw on the lid, set it on the base, and twist to blend. The one drawback is that it’s not very quiet. You can chalk that up to the powerful motor, but the good news is that because it blends things quickly, it won’t be noisy for very long. 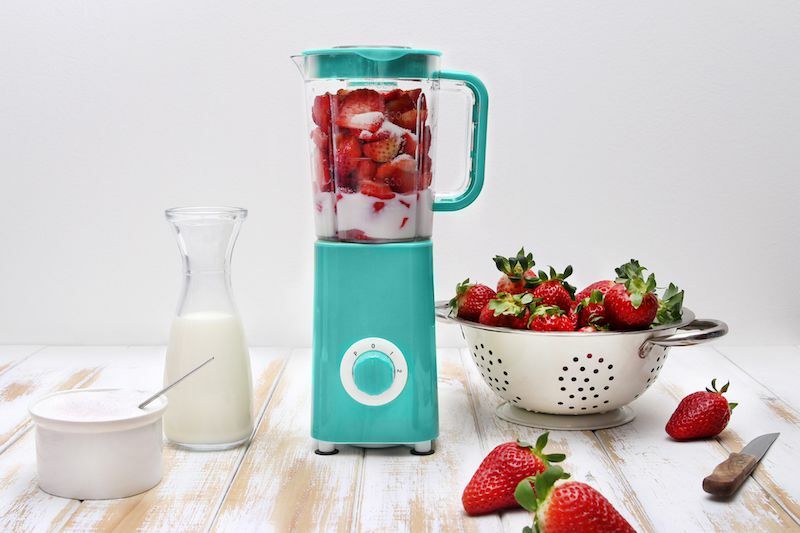 Those who travel often or perhaps want a fresh smoothie at the office will fall for this rechargeable blender that you can blend up wherever you desire. Just charge the base for four to five hours with the USB charger fill the top up with your contents and you can take with you and blend whenever you are ready to enjoy. This model also comes with an ice tray that makes the perfect sized ice for blending a smoothie. Reviewers comment this is a great gift and works well for college students. If you don’t have a lot to invest in a personal blender, but you still want something to make your morning smoothie, this is the right pick for you. Even better, it comes in a rainbow of colors including light green, emerald, raspberry, and Monaco blue. If you prefer, you can also get it in an all-white version that comes with two blending jars. The narrow blender won’t take up much space on your counter, but still has plenty of power with a 175-watt motor. Being a budget pick, this blender come with just one blade and one jar, and has a single speed. But that’s still enough to tackle most tasks. The BPA-free blender jar is also sized to fit in most cup holders. Since it’s so small, it’s easy to leave out on your countertop, but if you do store it away after each use, the cord wraps around the base for easy storage. You’ll also appreciate that the lid and blender jar are dishwasher safe for easy cleaning. The most common use for personal blenders has to be the morning smoothie. The ability to blend and go is a must for most people investing in this appliance, and that’s why this model from Oster is a winner. The sport bottle is perfectly designed for drinking your smoothie or protein shake after it’s blended. In fact, the jar looks more like a travel mug than a traditional blender jar. We especially like that you don’t have to leave the blades in the jar when you take it to go, like you do with some other blenders. You’ll also get a range of color options with this model—including blue, green, pink, orange, red, and teal. The colorful 20-ounce bottles are both BPA-free and dishwasher-safe making them safe to drink from and easy to clean. The one-touch operation makes blending easy, and you can rest assured that the 250-watt motor can handle ice and frozen fruit as well as softer ingredients. You can also blend individual portions of soup in this blender, just so long as the liquids aren’t boiling hot. Finally, this is one of the quietest blenders on our list. Our reviewers spent 12 hours testing one of the most popular personal blenders on the market. To really get the full experience, our testers set up this blender in their kitchens, made everything from smoothies to pesto, and cleaned up. We asked them to consider the most important features when using this blender — from its size to its power — and we’ve outlined them here so that you, too, know what to look for when shopping. Number of to-go cups Single folks may not want multiple cups that they’ll need to store, but if you’re making morning smoothies for the family, having one for each person might be nice. While you can usually buy additional cups for these blenders, it’s convenient to get exactly what you need all in one kit. Blender cup sizes How big is your morning smoothie? Do you like the idea of blending once and then portioning it into several cups, or do your family members have different flavor preferences? Look for a kit that’s right for you. Power While wattage isn’t the perfect indicator of a blender’s power, it’s a pretty good hint. If you typically blend softer foods (like bananas and yogurt), you won’t need as much power as someone who plans on blending hard vegetables, ice, and frozen fruits. Higher power can also mean that the blender will be a little noisier — which might be a consideration if you’re blending in the morning while your family’s still asleep.